Behind all the bluster is a US military with morale at an all-time low, with preparedness in many cases abysmally inadequate, and using technologies that are costly to taxpayers and far behind the state of the art of other potential adversaries. All are symptoms of a failing former sole superpower whose military is being gravely abused and misused, far from the intent for defense of the nation. This August the USS John Sidney McCain, a guided-missile destroyer of the US Navy’s Seventh Fleet collided with an oil tanker off Singapore, killing ten sailors. 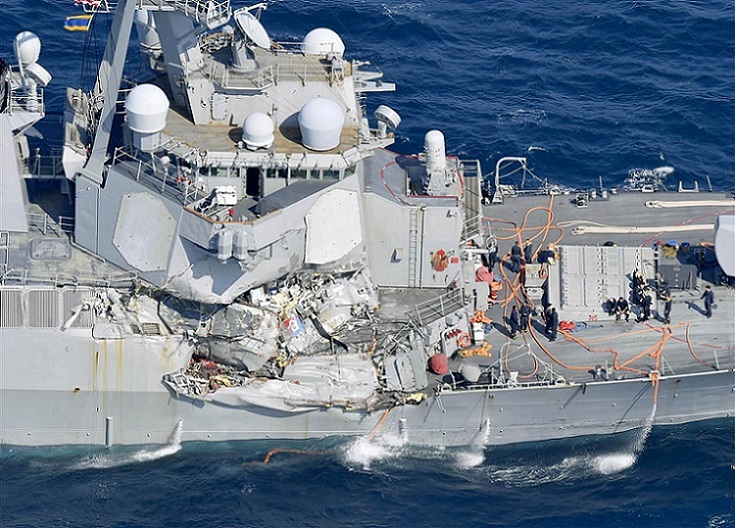 Two months earlier the Japan-based USS Fitzgerald collided with a merchant ship killing seven sailors and causing an estimated half-a billion dollars in damage. A Naval intelligence investigation found zero evidence of cyber-attack. For once Washington did not try to blame Russia or China. The fault lies at home. Incredible as it may seem, for the world’s largest and most formidable Navy, a decision was made during the Bush-Cheney Administration when Don Rumsfeld was Secretary of Defense to “save money” by scrapping the traditional training of Navy officers. As naval electronics such as advanced radar, sonar, gun, missile, and data linkage systems became more complex during the 1960s, the Navy created what was called the Surface Warfare Division Officer School which gave future officers a rigorous 12-14 months of training before they boarded their first ship. In 2003, it was shut down “to create efficiencies,” and replaced by computer-based training (CBT). Instead of attending the earlier training, new naval officers were given a packet of computer training discs and the ship commander was told to be responsible for the competence of officers under their command. Vice Admiral Timothy LaFleur, the one responsible for the decision, sharply criticized by many officers, insisted the elimination of serious training would, “result in higher professional satisfaction, increase the return on investment during the first division officer tour, and free up more career time downstream.” The training cuts saved a ludicrous $15 million a year. Moreover, over-reliance on “fail-proof” electronics such as automated radar systems and the automatic identification system (AIS) led to abandonment of human watch-standers actually looking out the bridge window of the ship for dangers. No one was watching on the USS Fitzgerald or the USS McCain. The commanders of the USS Fitzgerald and the USS McCain were relieved of their commands, hardly a serious response to the deeper problem. The rot goes much deeper. As any honest experienced military veteran of the 1960s Vietnam War can attest, there is a crucial difference if you come as a foreign soldier to a land and its people who are fighting for their independence from foreign military occupation or defending from foreign attack. Ho Chi Minh, Chairman of the Central Committee of the Workers’ Party of Vietnam, who spent years in the United States and France, led a vastly under-equipped army of peasants against the best-equipped armed force in the world and ultimately won. The fact that the armed forces of the United States, since the end of the Cold War with the collapse of the Soviet Union in 1991 has not had a convincing “evil” adversary, has had a huge effect on morale. Going to Afghanistan in 2001 to destroy Osama bin Laden, then to Iraq to destroy Saddam Hussein, then to Libya to destroy Muhammar Qaddafi, now to Syria to destroy Bashar al Assad—none of these “adversaries” are morally convincing to most Americans. Not surprisingly, in this context the US Armed Forces are having difficulty recruiting sufficient qualified, intelligent service personnel for the wars that Washington and its patrons in Wall Street seem to want to wage around the world. This year to meet its quota of new recruits to fill its global missions, the US Army has had to accept recruits with lower qualifications, to take recruits who scored in the lower third of the tests, so called Category Four recruits, including those with records for drug use. And it is not only the lack of sufficient preparation of its Army personnel or of its naval officers. On October 23, the US Air Force revealed that it is preparing its fleet of B-52 nuclear-capable bombers for 24-hour alert status, something not done since the end of the Cold War, according to Defense One. Airmen at the Barksdale Air Force base are readying the planes “in case the alert order is issued.” The B-52s would be armed with nuclear bombs available to take off at a moment’s notice something that was discontinued with the dissolution of the Soviet Union in 1991. The mad new plan of Trump’s generals however, has an added problem. The Air Force has a dramatic shortage of qualified pilots. On October 21, President Trump signed an executive order allowing the Air Force to call back to service up to 1,000 retired pilots, by expanding a state of national emergency declared by George W. Bush after Sept. 11, 2001. The order is part of an attempt “to mitigate the Air Force’s acute shortage of pilots,” according to a Pentagon spokesman. For decades the US military–whose annual budget exceeds that of China, UK, France, Germany, and Russia combined–has waged wars against military opponents such as Iraq or Afghanistan or Libya where there was no contest. Now, with the emergence of China as a genuine great power, with the rapid emergence of Russia as a great power in cohesion with China’s vision of an emerging Eurasia, the Trump Administration is warring around with everybody everywhere in what is clearly not either a healthy conduct of US foreign policy nor a serious manner for a mature nation to behave. Building up and restoring America’s rotting domestic infrastructure, not building up the US military against concocted threats or nations who ask the right to own sovereignty, building the real American economy to rejoin the ranks as a leading industrial nation makes far more sense in my view.